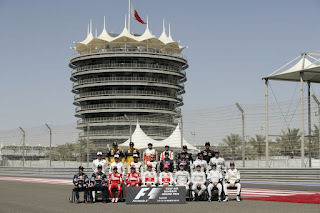 The small Persian Gulf island of Bahrain played host to the kick-off of the 2010 Formula 1 season. Before the start of the race, the Scuderia Ferrari team swapped out the engines in the cars of Alonso and Massa due to suspicions with the powerplants. While in previous years that would have resulted in a 10-grid spot penalty, 2010 regulations now state that each driver is allotted 8 engines for the season which could be used however the teams wish. Therefore, Alonso and Massa were allowed to retain their starting positions for the Bahrain Grand Prix. As the 24 cars assumed grid positions for the 2010 season opening race, the heat of the 30-plus degree Celsius day provided a symbolic ambience to the intensity of this first grand prix of the year. Winning the top spot on the standing start through qualifying of day 2, Sebastian Vettel's Red Bull-Renault experienced a perfect launch to the young German hot shoe. Early in the race, Ferrari teammates battled as team newcomer Fernando Alonso passed the Formula 1 team's incumbent Felipe Massa for 2nd place. Indicative of a driver who experienced very little track time, the rookie Indian driver Kuran Chandhok suffered an early retirement with his HRT-Cosworth after a second lap crash. The second HRT-Cosworth of Chandhok's teammate Bruno Senna didn't fare much better retiring by the 17th lap. While troubles haunted the debut of the HRT Formula 1 team, Virgin GP joined their fellow new F1 entrant in early retirement hindered by mechanical issues. Virgin GP's best result came from Timo Glock lasting only 16 laps until falling out due to a gearbox problem. What's interesting is that Glock's Virgin-Cosworth is running the spec gearbox supplied by Xtrac to Virgin GP as well as three other teams as a cost-cutting measure. The only Xtrac gearbox failure, the widespread use of this component could spark concern as the season endures. As the pole sitter Sebastian Vettel appeared destined to claim the first race of 2010, his Red Bull Racing car began to slow unexpectedly. By lap 34, Vettel's race-leading car fell into the grasp of Ferrari's dynamic duo Fernando Alonso and Felipe Massa. Both red Ferrari F10s passed the Red Bull Racing car by the end of lap 35. While thought to be a broken exhaust, the slowdown of Vettel's Red Bull Racing-Renault was attributed to a spark plug. When everything was said and done for the 2010 Bahrain Grand Prix, the power loss on Vettel's Red Bull would cost the German driver a podium finish. Without any interruptions through the final 15 laps of the Bahrain Grand Prix, Alonso pulled out a 16 second lead on his teammate Massa to win his first Formula 1 race since the controversial 2008 Singapore Grand Prix with Renault. In the 3rd and final podium spot, the McLaren-Mercedes team 2008 driver champion Lewis Hamilton came across the line 23 seconds behind the lead Ferrari. Admitting to a lack of speed, the McLaren F1 team has gained begging rights placing one of their cars over the Mercedes GP factory team in this first race. As for the factory-backed Mercedes GP, the all-German driver lineup flew their team and country colours admirably in this first outing. Nico Rosberg finished 5th narrowly missing the opportunity of gaining one more spot from the wounded Red Bull-Renault of Vettel. In his much-anticipated return to formula 1, the 41-year old Michael Schumacher rejoined competitive ranks in 6th place behind his younger German countrymate. Thanks partially by the new points system which was designed to improve competition among the mid to rear-running teams, Force India and the Williams F1 team enjoyed scoring their first points for the season. Vitantonio Luizzi Force India-Mercedes finished 9th while Rubens Barrichello grabbed the final point available crossing the line in 10th place. Lower in the grid, the Lotus Racing team made performance honourable to the history of the predecessor team founded by legendary car owner Colin Chapman. Underpowered and underexperienced compared to the existing teams, their best efforts are clearly far from performance of Ferrari. However, with the Bahrain Grand Prix being their first maiden, Lotus Racing drivers Heikki Kovalainen and Jarno Trulli made sure that the Formula 1 fans knew the team competed. Three laps down in 15th position, Kovalainen achieved the Lotus Racing's goal by finishing the first event. Trulli was almost able to bring the second Lotus T-127 race car but suffered last lap hydraulic problems.